"Old Skool TVR 2500 M"
We bought this car in September 2000 after looking around for about 6 months. I had first seen one of these at the International Car Show in 1973 and wanted it but being not long out of school and newly married owning one was out of the question. When I did start seriously searching for one I was surprised to find that only 947 of this model had been built. After looking on the Internet and considering trying to buy outside the country I was lucky enough to find this unmolested car 40 miles from home. As far as I know it is original except for the paint which was done about ten years ago but is the original colour and the tires have been replaced. The odometer showed 58788 miles when I bought it and there is very little wear apparent anywhere inside or outside the car. TVR have always made special cars for the driver a winning combination of power and light weight for the ultimate drive. http://home.worldchat.com/~spitfire to see more cars in the Unofficial TVR owners group. For those unfamiliar with a TVR they are an English sports car built by hand instead of on an assembly line. They have a tubular steel frame and a fiberglass body and utilize other car manufacturer's running gear. 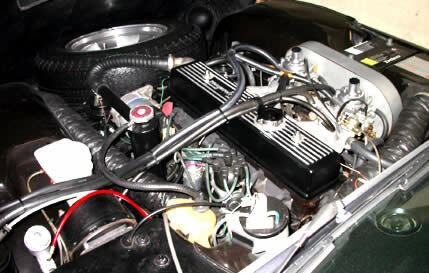 This model is powered by a Triumph 2.5 litre OHV S6 that develops 108 HP and has a TR6 four speed transmission. The car weighs about 2200 lb. and will accelerate from 0-60mph in 9 seconds but the best feature of the car is the way it handles. The weight distribution is 50-50 and because of this it goes around a corner like it's on rails. It may not out accelerate a lot of cars but there probably aren't too many that are as solid feeling on a winding road. 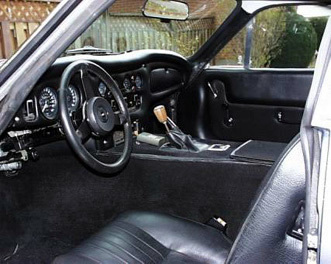 The interior is fairly cramped but comfortable for driving as you feel held in place by the door on one side and the high transmission tunnel on the other side. All the gauges are easy to see and the controls are at your fingertips. Even though it has a fiberglass body noise is minimal when you are driving and the exhaust note is quite pleasing. With both windows rolled down and the sunroof open you can carry on a conversation in a normal tone of voice. In this shot you can see the Wolfrace wheels, Webasto sunroof and vinyl top which were factory options. I hope to enjoy the car for the next couple of years and then do a frame off restoration to bring the chassis and running gear back to the same condition as when the car was built. Getting parts is no problem because the Triumph running gear and most of the TVR parts are still being manufactured . Front end has now been rebuilt and the motor will be coming out in the spring for a rebuild. Also front and rear shocks and springs will be replaced with AVO units. To meet other classic car enthusiasts and talk cars with real die hard enthusiasts join us in our friendly forums.